Ceiling light fixtures are relatively new within the scheme of house lighting. Gas lighting near the ceiling gave way to the newer knob-and-tube method of running electrical wire. This meant that wires could be run between floors or in an attic with relative safety. Ah, the familiar flush and semi-flush ceiling lights! They are found in literally every home. Builders will install these as "default" lights unless otherwise requested (electrical code requires every room to have lighting, so this is a way of taking care of that requirement). These lights hug close to the ceiling electrical box (which means that they also hug close to the ceiling) and typically drop down between 6" and 15". They are stationary. Where to Install: Bedroom, bathroom. Cheap. You can pick up a flush or semi-flush ceiling light for as little as $5-10, if you really want one that cheap. And that's why many builders install them unless otherwise specified. Dependable. Unlike recessed, track, or cable lights, these are uncomplicated devices, the true workhorse of ceiling lighting. Quality of Light. These lights cast an overall-room brightness, without giving you enough light to concentrate on specific tasks. While a flush or semi-flush mount will not provide all of your kitchen ceiling lighting, it's a good base-level light to start with. Recessed lights--also called canister or can lights--came of age in the 1970s and 1980s. It seems that every house built in the Eighties had recessed lights. Of course, their ubiquity meant that they would soon become roundly disliked. Recessed lights consist of the metal canister and the bulb. Both are housed within the ceiling itself, so that no part of the light protrudes below ceiling level. Where to Install: Living room, family room. Clean Lines. If you have a modern house, recessed lights are probably the way to go--they minimize obstructions and let you concentrate on other aspects of the home. Difficult to Move. You would need to access the light from the attic, patch the existing hole, cut a new hole, and re-install. Fire Danger. Certain types of recessed lights can be covered in insulation in the attic. Even so, some residential codes do not allow installation of recessed lights in such areas due to inherent fire hazards. Fixture Shown Here: From The Home Depot, this is just the baffle (trim) part of a 6" Halo recessed light (I have selected this image because it is indicative of the way it will look when installed). In terms of ubiquity, pendant lights are the new recessed lights (can you say "Starbucks"?). 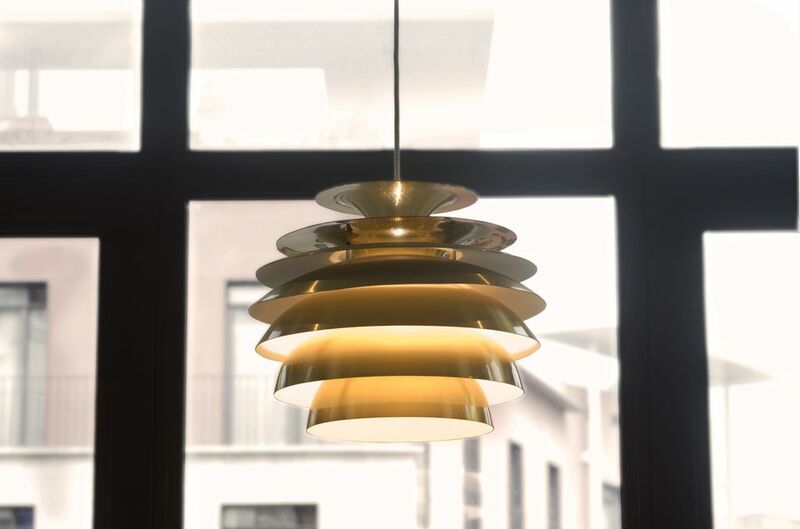 For a time in the late 1990s, pendant lights were the hottest thing, the ultimate in urbanity. Now that their influence has spread, it's their functionality that has remained. Pendant lights are a wonderful way to bring light closer to your work surface. Where to Install: Kitchen island, kitchen counters. Spotlighting. As mentioned, pendants allow you to focus light on a particular area. Overused. If you don't mind being like the Joneses, buy a pendant light. But remember that the Joneses are probably buying the popular and overdone "capsule" style glass fixtures. Suggest: experiment with the fixture and try something different, like the one shown here (yes, this is still a pendant light). Fixture Shown Here: IKEA. KNAAPA. When most people think of chandeliers, they think of fancy fixtures dripping with sparkling glass. If this is to your taste, that's fine. But as long as the fixture both hangs and displays multiple bulbs, it's a chandelier--so, any style is possible. Where to Install: Dining room. Adjustable Height. Chandelier fixtures usually can be adjusted up or down to better accommodate the table below. Costly. By virtue of the amount of materials used in chandeliers (more metal, more bulbs, etc. ), chandeliers tend to be expensive. That's one reason why you confine chandeliers to one place, instead of sprinkling them all around the house. Fixture Shown Here: allen + roth 18-Light Bronze Chandelier from Lowe's. Where to Install: Kitchen, bathroom, den, mancave, home theater, hobby room, workshop. Adjustable. Yes, in theory, you can endlessly move track lights along the track. Will you, in practice, do this? That's the question. You might do this in a room with a lot of activity, such as a workshop or hobby room. Unsightly Tracks. The tracks are large and difficult to disguise. Fixture Shown Here: The Maxim MX 92320 from LightingDirect.com. A newer version of the track light. Rail or cable lights pull their power from a continuous, charged metal rail or thin cable (your choice). Unlike the track light's track, which was meant to be camouflaged, rails and cables are meant to be seen: they are part of the style. Where to Install: Kitchen, bathroom, den, mancave, home theater. Adjustable. Like the track light, you can slide the lights along the rail or cable to any spot. Very Noticeable. Yes, the rails and cables are part of the look. But in many cases, they draw too much attention--away from other room elements. Fixture Shown Here: The LBL Lighting Straight Rail Monorail System Kit from LightingDirect.com.